Philippe Clerbout, the Frenchman who searched for 10 years to return the dog tags to Mr. Wilkins, meets the WWII veteran for the first time at the GI Go Fund One Stop Veterans Office in Newark City Hall, and also presented awards to Mr. Wilkins for his service in France. This past May, the story of Willie Wilkins, the Newark resident and WWII veteran who had his long lost dog tags returned to him after 69 years, made international headlines. Now, the man who worked for over 10 years to find Mr. Wilkins finally had the opportunity to meet him in Newark and deliver medals and tokens of appreciation from the French town he saved during the war. Philippe Clerbout, whose love for the U.S. Military for bringing his own father back home to France after he spent five years in a Nazi POW camp led him to search for Mr. Wilkins, met him at Newark City Hall the GI Go Fund’s One Stop Veterans Office, the same office that connected Mr. Clerbout to Mr. Wilkins in May. Mr. Clerbout presented Mr. Wilkins with the Auchy-les-Mines Town Medal in the city’s Rotunda thanking him for what he and the U.S. Military had done for all of the citizens of France. Willie Wilkins, a South Ward resident, served in a U.S. Army Quartermaster Graves Registration unit in the invasion of Southern France in August 1944. During the campaign, he lost his dogtags, in the French town of Istres. Twelve years ago, a resident of Istres, Anne-Marie Crespo, was digging in her garden when she found Mr. Wilkins’ dog tag. With the help of friend Philippe Clerbout, Ms. Crespo contacted the U.S. Department of Veterans Affairs in Indianapolis, which in turn connected with the GI Go Fund and found that Mr. Wilkins was alive and still living in Newark. They confirmed with Mr. Wilkins’ daughter Carol that Mr. Wilkins had lost his dog tags in France, and arranged for the return of the dog tags. In addition, the GI Go Fund is working with the Veterans’ Administration to ensure that Mr. Wilkins is receiving any and all veterans’ benefits to which he may be entitled. 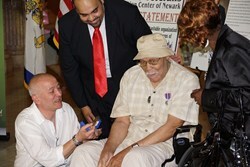 Mr. Wilkins received his dog tags during a surprise ceremony at Newark City Hall on May 8th commemorating V-E Day. During the event, Mr. Wilkins was presented his dog tags, along with the New Jersey Distinguished Service Medal, by Newark Mayor Cory Booker, GI Go Fund Executive Director Jack Fanous, and French Consul-General Bertrand Lortholary. Mr. Clerbout also presented a Patch to Mr. Wilkins from the Web Detection Association Post 62, the Medal Detector association that helped assist Mr. Clerbout in his initial search, along with a copy of French newspaper that had Mr. Wilkins’ story on their front pages. Moreover, the City of Newark extended its thanks to Mr. Clerbout by presenting him with the Commemorative Plaque from Mayor Booker and City of Newark. This was the first ever meeting that united the WWII hero with the Frenchman who spent over a decade searching for him, and will be the last chapter in a nearly 70 year journey for a remarkable member of America’s Greatest Generation.